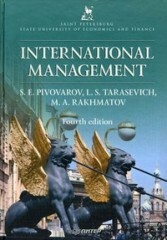 The 4th edition of the International Management textbook covers the basics of international business and explains broad international practice of strategic and operational managerial decision-making in light of the challenges peculiar to Russian economy. The 4th edition features a large new chapter on international tax planning, covers SME’s globalization survival issues, as well as main internationalization trends in the Russian business. The textbook is geared toward students, post-graduates, and the faculties of economic schools and other higher education facilities majoring on management, and can be recommended to wider audience of professionals who deal with international aspects of Russian companies’ business.